Love was in the air last weekend as three celebrity couples got married. Chelsea Clinton married Marc Mezvinsky, Alicia Keys married Swizz Beatz, and James Van Der Beek married Kimberly Brook. 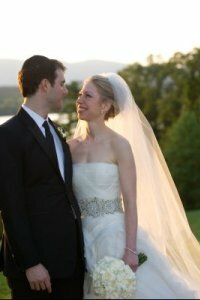 Chelsea Clinton wed her longtime boyfriend, investment banker Marc Mezvinsky on Saturday, July 31, in front of 400 people at Astor Courts in Rhinebeck, New York. Chelsea Clinton’s wedding wasn’t quite the star studded event wedding watchers had anticipated, but aside from the bride’s famous parents, former President Bill Clinton and Secretary of State Hillary Clinton, Vera Wang (whose dress Chelsea Clinton wore), Ted Danson, Mary Steenburgen, former Secretary of State Madeleine Albright and film producer Steven Bing were in attendance. That same day, musician Alicia Keys married Swizz Beatz, otherwise known as Kasseem Dean, in a private home on an island in the Mediterranean Sea. The bride also wore Vera Wang as Dr Deepak Chopra officiated the ceremony. Alicia Keys and Swizz Beatz are expecting their first child together. On Sunday, August 1, James Van Der Beek made an honest woman of his pregnant girlfriend, Kimberly Brook, whom he met in July 2009. Congratulations go out to all three happy couples!